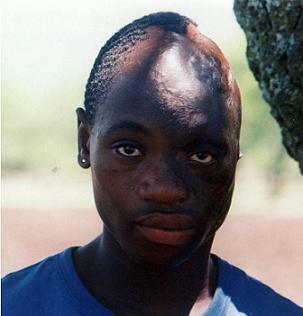 Zipho Zwane was born on Christmas Day in 1983, in the rural Madazane area of KwaZulu Natal in South Africa. Home was with his extended family in a small group of traditional huts, separate from any other community. When he was just one month old, his mother Dumile Zwane went to collect wood and left him in the care of his sister aged 10. The little girl went out to play and her baby brother's blanket caught alight as he was too close to the fire. A neighbour heard Zipho crying. She put the blanket and the child straight into water. He was taken to Ladysmith Hospital, about 30 km away. He was so badly burned that he remained in hospital for one year. Seventeen years on, his injuries are still highly visible. They include burns to left scalp, with hair and ear gone, damage to one arm and severe damage to one hand. A small hole remains where the left ear should be. After meeting him in October 2000, the charity contacted Professor Peter Owen at the University of the Witwatersrand. He and his colleague Dr Leanne Sykes are arranging an assessment and an operation for December 2000, when titanium implants will be placed in Zipho's skull by maxillo-facial surgeon Greg Boyes-Varley. Then in early 2001, a screw-on silicon-rubber prosthetic ear will be made. Only a handful of people have such skills in South Africa. Implants cost a lot more than glue-on ears but work a lot better. There are no embarrasing moments of the ear being knocked off, nor the problem of buying expensive glue long term - and storing the glue safely in hot remote rondavel (Zulu hut) - and no problem of an allergic skin reaction to prolonged use of glue. Once Zipho has a prosthetic ear to match his real ear, the charity will contact surgeons in the Durban area to assess the viability of restoring Zipho's hairline or improving the use of his damaged hand. Zipho is in Standard Seven at Dumisa Secondary School. He copes at school as his fellow pupils are familiar with his appearance, but he is worried about the future. He does not have a girlfriend. He most wants 'to look more acceptable to the world'. Children of Fire's representative in rural KwaZulu Natal, Margaret Kunene, has found several burned children who need help. Zipho is the first one to get surgery.